Based on the overwhelming success of 1948’s serial Superman, Columbia Pictures and producer Sam Katzman decided to get the gang together for a sequel. 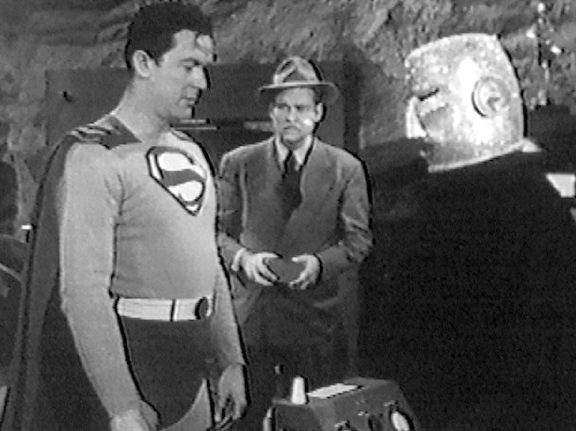 So in 1950, children found that the Man of Steel had returned to their local movie houses in Atom Man vs. Superman. With a screenplay by George H. Plympton, Joseph F. Poland, and David Matthews, and directed by Spencer Bennett, the original cast joins with Lyle Talbot as Luthor to tell a sprawling new story. Like its predecessor, this is an interesting look back at a time when entertainment was more innocent and more naïve. This is a serial that is unabashedly for children and says “To hell with the adults!” It makes me wish I’d been a child back then to see it and other serials of its ilk. Once again, the cast is really good. This shouldn’t come as a shock since Kirk Alyn, Noel Neill, Tommy Bond, and Pierre Watkin return as Clark Kent/Superman, Lois Lane, Jimmy Olsen, and Perry White. With the exception of Ms. Neill’s hair and hat (her hair is shorter and black this time, more like her comic book persona) nothing about the actors has changed in two years. Most of their performances are as good, if not better, than they were in the previous serial. Alyn once again dons the cape with gusto and enthusiasm. This is a Superman who revels in being Superman. Clark Kent is just as lazy and cowardly as before, with that twinkle in the eye that lets the kids in the audience know that Superman is just around the corner. 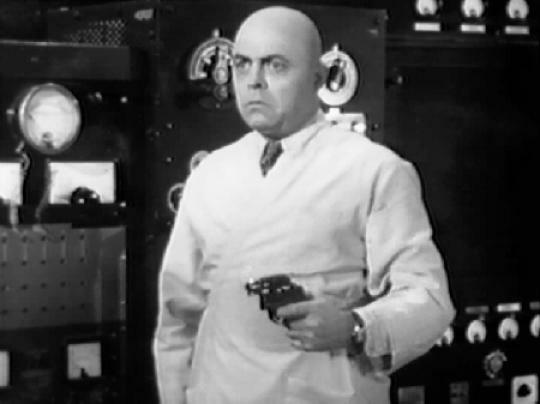 Lyle Talbot as Luthor is possibly the closest Lex Luthor has been to the comic book version on the silver screen. He’s intelligent, mean, and more than willing to do what it takes to become powerful and destroy Superman. While everyone gets hung up on Gene Hackman’s portrayal of Lex Luthor, Talbot’s is certainly not going to surround himself with the likes of Miss Teschmacher and Otis. Luthor isn’t a joke in this serial. The story is once again quite epic. I guess it’s difficult not to make an epic story at 15 chapters of 15-to-20 minutes in length (nearly four-and-a-quarter hours). With the mysterious Atom Man to contend with, and the newly “reformed” Luthor suspected to behind him, Superman is kept busy. The story is grander, including a place called The Empty Doom (which is a lot like The Phantom Zone) that we actually go to, a spaceship for Luthor’s escape from Earth, a flying saucer that shoots Clark and Lois down (cliffhanger! ), ray guns, synthetic Kryptonite (that’s missing one element to truly work–sound familiar? ), and– Well, you should just trust me on this. It’s massive. 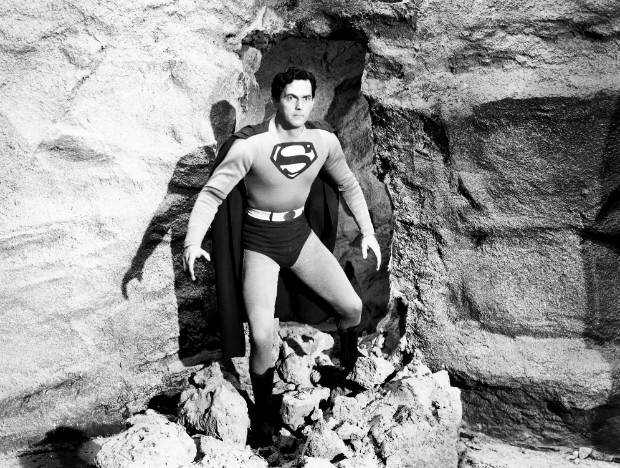 All right, in the last essay, I pretty much bashed the writing and direction of Superman (1948). In many ways, the same problems persist. While there are very entertaining parts of Atom Man vs. Superman, there are some show-stoppingly bad parts. The serial is off to a pretty fast start, since Superman’s origins were told in the last movie (chapter 1), so we get to see our Metropolitan friends going about life and our Kryptonian hero do heroic things. Somewhere around the halfway part of the series, though, things begin to go wrong. Chapter 7, “At the Mercy of Atom Man”, the story stops dead as Luthor tells his aide the story of Krypton and Superman’s origins. Now this came as a shock because the way the story was told in the first serial, even Superman was unaware of where he came from. He suspected it was the planet Krypton because Kryptonite had an ill effect on him. Not only does Luthor retell the origin, but the audience is given much of the Krypton scenes from the first serial’s first chapter all over again. If you didn’t see it the first time back in 1950, this was probably great–especially if you were a kid–but even back then, an adult would’ve rolled their eyes at the strange nature of the backstory. And how does Luthor know? He was the only person on Earth who was able to decode a message from Jor El, sent out across the universe to get help for his doomed planet. From this point, the story gets weird. Lois Lane quits the Daily Planet after one insult too many from Perry White and she goes to work for Luthor, who now runs the local TV station. He says he’s reformed but Lois and Clark and Jimmy and Superman have spent the first half of the serial not believing him. But now she believes him. To make matters worse, her journalistic integrity is thrown to the curb because she’s a girl-on-the-street stopping pedestrians to ask them about the weather or if they prefer country life or city life. The one news story she’s sent on as a TV reporter–a major flood in the upstate town of Lawnville–she messes up because she refuses to take heed when the police tells her to move, the flood was on its way. There are other strange things, too, and stupidity on the part of the characters so the story will keep going. Lois Lane isn’t herself in this serial. Look, Noel Neill is Lois Lane. She played the reporter through these two serials and all but the first season of the 1950s TV show The Adventures of Superman. And she was spunky and dead-on in the first serial, but in this serial I think she could have been better. Not only is the part written pretty poorly, but she sometimes goes through scenes as though she’s sleepwalking. Now, I don’t think it’s her. I think she was directed poorly. Maybe it was the huge amount of work filming a serial for a low budget took. I don’t know, but this Lois Lane is good sometimes, and other times she’s just blah. I wanted to like her but just didn’t care. Again, I think it was the way she was directed. I hope it was. Atom Man was lame. His costume was horrible and he was confusingly lame. The big reveal on his secret identity was silly, too (thought surprising). Atom Man could be called Bucket Head and would have the same effect. The budget seems better on this one than on the prior one, though not much. It could just be a trick, though. Either way, lack of a budget means silly-looking stuff. The animation is even greater this time around. Though I give kudos to them showing us Superman flying up-close, so Kirk Alyn could be seen “flying.” The animation doesn’t only go to Superman flying, but also the flying saucer and spaceship I mentioned. Superman going to save a bridge from Atom Man’s evil ploys. The bridge is the famous Tacoma Narrows Bridge, aka, Galloping Gertie. My feelings of Atom Man vs. Superman are pretty similar to my feelings on 1948’s Superman. They’re both great fun if you go into it with the sense that you’re time-travelling. If you’re looking for a deep, modern Superman adventure, you’ll hate these. If you want to see adults essentially do with Superman what you would’ve done with your action figures at six or seven years old, then you’ll enjoy them. I’m really glad I watched these serials. They were only the third and fourth serials I’ve seen and they made me want to see more. They’re also fun to see from a historical perspective, like when Lois Lanes is annoyed with her “newfangled typewriter,” which looks like a manual office model except is electric. Also, seeing an early TV is pretty cool, too. Overall, I recommend the serials, but only if you’re willing to play along. Take them for what they are: stories meant for young fans in a different world, a world before John F. Kennedy’s assassination, Vietnam, Nixon, Reaganomics, terrorist attacks, and overt cynicism. ¹ In rewatching The Incredible Hulk TV series for the past year (I’m almost done! ), I noticed footage reused over and over again, sometimes completely out of context. 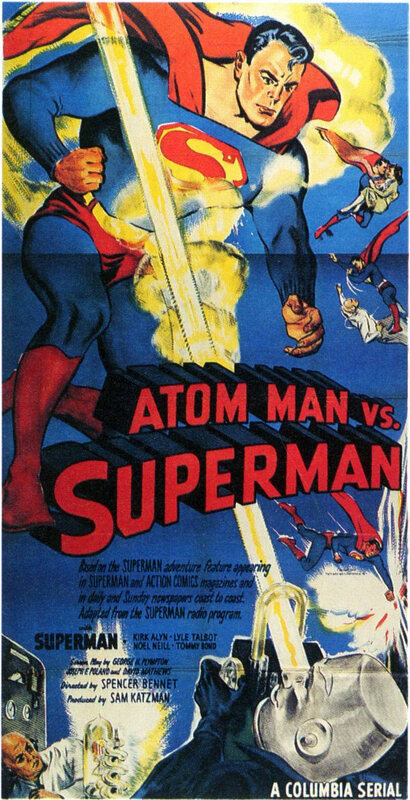 Posted on May 23, 2013, in Comic Books, From Krypton to Gautham, Memoir, Movies, Opinion, Random Stuff and tagged 1940s, 1950, 1950s, adventure, Atom Man, Atom Man vs. Superman, classic movies, criticism, Kirk Alyn, media, memoir, movie serials, movies, nostalgia, reviews, society, superheroes, Superman. Bookmark the permalink. Leave a comment.